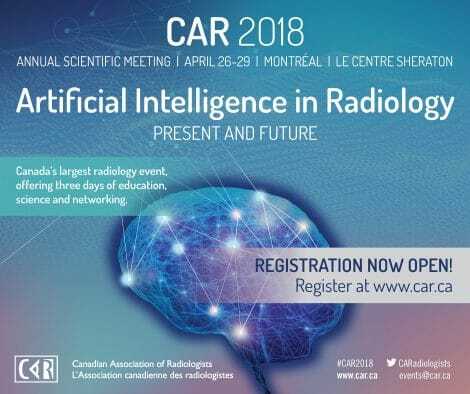 Artificial Intelligence in Radiology-Present and Future is the theme for CAR 2018, or more formally known as the 2018 Annual Scientific Meeting of the Canadian Association of Radiologists (CAR). Over four days in Montreal, radiologists, residents and industry partners from across North America will share their work, network, and socialize against a backdrop of topics that demonstrate how imaging is harnessing the power of technologies such as deep learning and artificial intelligence. Friday, April 27 will offer a track fully devoted to the use of AI and deep learning in radiology, with an emphasis on clinical applications. The morning will kick off with a primer on AI and what it means for radiology. In the afternoon, delegates will participate in didactic sessions about how North America’s radiologists are applying the technology in their clinical research, and how they stay abreast of the changes in a dynamic field. This year’s hands-on, interactive workshop will be dedicated to MRI of the prostate. This course will focus on practical problem-solving for the general radiologist, highlight PIRADS v2 technique with emphasis, and ample opportunity for case review. The Hands-On Prostate MRI Workshop is scheduled on Saturday, April 28. Registration required. Radiologists in-training will be welcomed in style during a dedicated reception exclusively for trainees on Friday, April 27. Additionally, there is education content specifically geared for trainees, including the perennially popular Junior and Senior Hot Seats sessions on Saturday April 28. CAR 2018 is open to CAR members, fellows, medical students, non-members and other industry stakeholders who can register now at an early bird price. Early-bird pricing expires March 1, 2018. For the latest updates to Canada’s premier radiology event of the year, search #CAR2018 on Twitter and Facebook @CARadiologists. For more information on CAR 2018 or to register now, click here.